What stands out in the transformation that has come about over the past 40 years since China began to open its doors is not only the degree of change but also how the rise of China has transformed the world. The starting point was the reform and opening-up policy initiated by Deng Xiaoping at the Third Plenum of the Eleventh Central Committee in 1978. Deng described the policy as China’s “second revolution.” Since then, China has become an economic power and an engine of global development. The reform and opening has meant a rise out of poverty for an estimated 800 million Chinese. China's GDP has grown by 32.3 times in 1978-2016, making it the second-biggest economy in the world since 2010. Its foreign trade in goods has grown by 178 times, making China the world's biggest trader since 2013. Its share of the worId economy grew from a mere 1.8 percent in 1978 to a staggering 18.2 percent in 2017. These often-quoted statistics are impressive and show a real change in the lives of millions of people in China and in the world. However, they tend to overshadow the simple reality that it was the work and creativity of millions of Chinese people in government, business, on farms and in every walk of life who have made this miracle. It is the people of China who are the architects and drivers of their country’s revival of pride and position in the world. Forty years of progress have not overcome all problems in China but the quality of life for the vast majority of Chinese has improved dramatically. Those who were there remember that only two generations ago millions of Chinese lived a precarious existence on small plots of land. Some speak of always feeling hungry, dreading any illness or other mishap which could be disastrous because there was no safety net of any kind. Now medical insurance ensures access to a growing number of hospitals and clinics. Food is abundant and affordable. Children have access to schools at every level with millions able to attend universities in China and, increasingly, abroad. The reform and opening-up has also benefitted many other countries. Over 130 countries trade most with China, and, since 2008, the least developed countries (LDCs) export most to China, selling about one fourth of their products to the Chinese market. China is also the biggest investor in LDCs, building infrastructure, creating employment and opportunity. Chinese tourists are now the world's third-biggest spenders, behind those from Germany and the US. As the people of China have stood up to join the world they have also influenced the daily lives of everyone on the planet. It is some of these small changes that we tend to ignore. The opening of a new high-end boutique of specialty teas is now common in many communities, where Chinese premium teas are served in elegant tea pots and cups fashioned in Asia. The ubiquitous Chinese restaurants of the past are now joined by dining rooms in Paris and Geneva that are featured in international restaurant guides. From producing every consumer good, including spatulas and toys, Chinese workers are now designing and producing automobiles of the quality and attractiveness to match any on the market. Chinese herbal medicines are available and appreciated everywhere, as are traditional treatments. Access to China and travel within the country is now available to millions of tourists from abroad. Many countries, such as Canada, have reciprocal agreements with China for issuance of 10-year visas, to facilitate travel for business and leisure. The biggest and most lasting change that China has brought to the world over the past 40 years is the sharing of its culture, its history and the long, patient pursuit of the peace and prosperity that China was famous for over centuries. The ways in which the Chinese people will help shape the world of the future remains to be defined. The first signs, after 40 years of reform and opening, are promising. What is most impressive about China today is its young people and their hopefulness. They are well educated and conscious of the past, of China’s golden eras and of the years of humiliation, but their eyes and hearts are set clearly on a better future. They think positively about the world, many of them have savored other countries and cultures, but in the vast majority of cases they are planning a future in China. 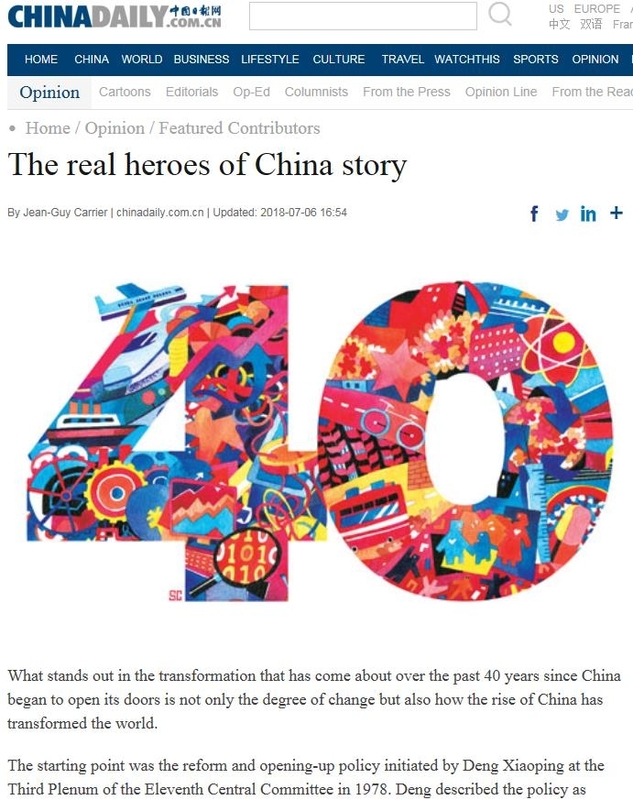 They came of age during the 40 years of opening up and worldwide engagement, and it has made them a generation of young people who are Chinese at heart and also citizens of the world. This is an important achievement for a people assuming a position of increased international responsibility and leadership. China remains a developing countryand its market reforms are incomplete. According to Chinese statistics there are still over 50 million poor in the country. According to a recent report by the Asian Development Bank, less than 1 percent of the 500 largest cities in China meet the air quality standards recommended by the World Health Organization, and seven of these are ranked among the 10 most polluted cities in the world. Under pressure from the population, governments in China are taking steps to reduce energy consumption, boost enforcement of environmental laws, expand the use of cleaner fuels to general power. China has become a major global producer and user of clean and renewable energy technology. By 2040, according to the International Energy Agency, renewable sources will account for 40 per cent of the country's energy generation while coal, which now provides two-thirds of China's energy, will drop to the same level. The reform and opening-up policy is continuing the process of engagement with the world. Its most recent manifestation is the Belt and Road Initiative, which aims to link many countries by land and maritime routes to favor commerce, cultural exchange and development. The author of the “Wealth of Nations”, Adam Smith – considered the first to have discerned the workings of market economies wrote this about China in 1776: “China has long been one of the most fertile, best-cultivated and most industrious, prosperous and urbanized countries in the world." That was when China was an economic power, accounting for over 30 percent of the global economy. China’s return to that position in this century will be the real achievement of the reform and opening of the country, and of the people of China who have made it possible. The author is the executive chairman of the Silk Road Chamber of International Commerce and a senior fellow of the Chongyang Institute at Renmin University.